Behtar India Campaign has now reached its final juncture, The Grand Finale. This campaign is the biggest inter-school competition based on environmental causes. The Season 2 of Behtar India campaign has been much bigger and better. 900+ Schools registered for this campaign along with 11,00,000 students and 32,000+ student volunteers. This eight-month long campaign focused on three main aspects– Health, Hygiene, and Environment with recycling as its central theme. Till now, Behtar India has been successful in recycling 8,07,452 KGS of waste. The students have been the main drivers and contributors to this campaign. Their journey has not been easy to meet the targets and focus on the three main aspects of this initiative. According to them, the process did not seem difficult because of their keen devotion and enthusiasm towards the campaign. India generates more than 1,00,000 metric tons of solid waste every day. 70% of this waste is recyclable but we recycle only about 30%. This campaign invited students from across the country to take actions which would be a collaborative effort to make this country a better place. The students had to collect bundles of newspapers and tag them with their names and phone numbers. 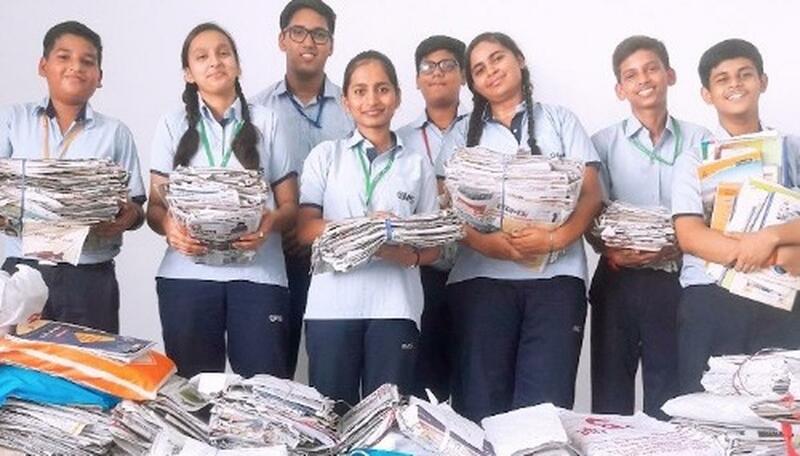 Later, they had to take these bundles to their schools, where the school had assigned a separate room called as ‘recycling bank.’ After the collection, the school coordinator had to claim collection of newspapers on the website of Behtar India. A recycler then collected newspapers and transported them to the newspaper recycling factory where recycled papers were made. The Behtar India campaign is an initiative which contributes to noble causes as well as rewards the students for their contribution. The students earn points for contributing to one of the 3 aspects of this campaign and will be rewarded with prizes for newspapers that they have recycled or the points they have earned. This campaign further gives them an opportunity to serve the society since all the proceeds go to the underprivileged children to protect them from diseases like dengue. The Behtar India Campaign, till now, managed to recycle about 8,07,452 KGS of waste, which created 8 times this impact on the country. While in the sphere of ‘Swachhta,’ the problem of growing population and an ever-increasing migrating rural population is constantly adding to the urban landscape. Adding to this, our indifference is making it near impossible to keep our cities clean. The solution to this is by going on cleanliness drives and cleaning an area together. The students used the idea of snowball effect to bring about a change, where it only takes one person to start the dive and the effect multiplies. In ‘Swasthya,’ the dengue fever, a mosquito-borne tropical disease caused by the dengue virus has affected nearly 110 countries worldwide. There is no known medication, and neither is any vaccine available in our country. If not treated early, it may also turn fatal. In India, it continues to involve newer areas and newer populations. The students fought this problem by collecting funds from people in their society or different schools and community to buy the dengue prevention kits and by creating awareness about dengue. Beyond that, it takes just Rs.300 to provide a DENGUE PREVENTION KIT to an underprivileged child. Till now Behtar India has been successful in providing 59,000+ DENGUE PROTECTION KITS to under-privileged students. b. Mosquito repellants to tide over the monsoon period. c. Dengue treatment covers worth Rs. 23,000 valid for a period of one year. This campaign has been successful due to the efforts put in by the students and coordinators. The unique format not only helps the government’s efforts to provide promotive as well as preventive healthcare to the community, but also ensures quality healthcare and behavioral changes in the fields of hygiene and environment. The initiative is a contest for schools and students, a CSR and an employee engagement window for companies, social service for individuals, an amplification tool for the municipal corporations and for the under-privileged children, it is an opportunity to receive free health benefits. Behtar India, 2018: Did You Know Parineeti Chopra Has Two Waste Baskets In Her House?